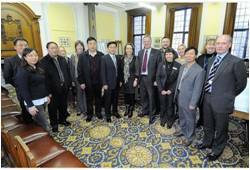 WHILE David Cameron was in China for business during the later part of 2013, a group of Chinese visitors came to Torbay to admire its beauty. The resort welcomed a delegation from the Yuntaishan Global Geopark in China to learn more about the English Riviera Global Geopark as the status gains increasing recognition worldwide. The delegation included representatives from the Bureau of Land and Resources Ministry from Henan Province, Jiaozuo City, Xiuwu County, Wen County along with a representative from Henan Tourism Bureau and Zhongyuan University. Melanie Border, English Riviera Geopark Co-ordinator said: "This type of visit is always a wonderful opportunity to learn from each other and share." Discussions were held at the Town Hall when the delegates met mayor Gordon Oliver and other members of the Geopark Management Group and this was followed by a Geopark tour. Mayor Oliver said: "I cannot emphasise enough how important our Geopark status is globally and nationally which showcases the landscape and culture of our beautiful bay. Our recognition as a Global Geopark is going from strength to strength and it was great to welcome our recent guests from China who we were able to share this with." Melanie added: " It always feels great to share what makes our Geopark special and this group were particularly impressed by the interpretation at Torre Abbey, our integration of privately run Kents Cavern, the community based achievement of Paignton's Geoplay Park and of course the fantastic history of Berry Head." At the Geoplay Park the delegates met with a group of children from Curledge Street Academy who, thanks to the Paignton Community Partnership and Community Spaces, Big Lottery funding, were working with the Geopark's own arts Geo-collective to make a new film of a theme song for the park. The new film and song will be available via the Geopark website soon. Melanie added: "Our Geopark status really puts us on the international stage and since 2007 we have built up a strong and respected reputation within the Global Network . This is clearly reflected by the fact that this is just one of many fact-finding missions of Global Geopark delegates to visit from China this year". Other visits to take place during 2013 were from Hong Kong, Hexigten and Wudalianchi. Nick Powe, chairman of the English Riviera Geopark Organisation, added: "We use the natural environment of the English Riviera Geopark to encourage tourism, a common purpose we share with other Geoparks around the world, particularly in China. Promoting cultural heritage is another important aspect and of course the English Riviera has a wealth of heritage assets and traditions to interest visitors. In the same way we promote our links to prehistory, the coast line, local foods, Charles Darwin, IK Brunel, the maritime heritage etc.., Yuntaishan Geopark located about 450 miles south of Beijing in Henan Province is proud, among other things, to be the ancestral home of Kung Fu and Tai Chi. It's little cultural gems like this that make Global Geoparks different from other destinations. It's not all about the rocks! "The Global Geopark status puts us on a world stage which no other seaside resort can match. Each of these visits raises the profile of the English Riviera as a tourism destination and we are delighted that what we do encourages our colleagues at UNESCO to recommend visits of this kind to the English Riviera."